Presented here is an excerpt from the interview with Stan Sakai conducted by Kim Thompson in Fall, 1996. The full version of this interview appears in TCJ #192. KIM THOMPSON: You do a lot of research for Usagi, obviously. STAN SAKAI: Oh, I do as much research as I can. I have a pretty extensive reference library at home, and again, I try to make it as authentic as I can, within reason. There are a few very minor things, such as sandals, that I use a lot of artistic license on, but as far as the big things -- the code of the samurai, Bushido, houses, and the general culture -- I try to get it as accurate as a I can. In fact, one of my very favorite Usagi stories was the kite story (#20), and that actually took about two years to write just because of all the research involved. It started out as a grain of an idea when I bought a book on Japanese kites. It dealt with a kite festival, so I figured, "Oh, it'll be terrific to have a Usagi story based on the kite festival." I did some research and I found out how kites were made in that time, so I created a story from three different viewpoints: the kite maker, a gambler who was in town during the festival, and Usagi. I integrated all three elements into one story and I was really pleased with the outcome. Also, a lot of the character are based on historical figures. Usagi, like I said, was based on Miyamoto Musashi. Tomoe Ame, the female cat warrior, was based upon Tomoe Gozen, who was a female warrior famed for her beauty and her skill with the lance. She's an interesting character. There's not that much written about her; she lived during the time of the Gempei Wars, and her husband was a famous general who eventually committed seppuku but refused to let her die with him because he would have lost face if he was to die with a woman. So she eventually became a nun. Lord Hikiji, around whom a lot of the stories revolve, is based upon Date Masamune, who lived around the turn of the 17th century, and was one of the most powerful lords in feudal Japan. He too wanted to become Shogun, but he never did. Interestingly enough, he sent the first Japanese emissaries to Rome to meet the Pope, and it was a mission that ended in failure. But he was one of the most powerful and influential lords of Feudal Japan. THOMPSON: Right, from Yojimbo... all the way down to the way he scratches himself all the time. SAKAI: His scratching himself, his five o'clock shadow, and also the way he kind of manipulates people and things. THOMPSON: Aside from authenticity of decor and costumes to what extent do you work within the moral parameters of classical Japanese society -- do you reinterpret it somewhat for American audiences? SAKAI: I think I reinterpret it for American audiences. For one thing, I'm third generation Japanese-American. I'm not close enough to the source to portray it as accurately as someone else who is first generation; because of that most of my research is through books and films, and I reinterpret it. Also, there are a few things that I may allude to that I really don't go into much detail, such as the eta, which, at that time, was kind of comparable to the untouchables of India, the very lowest class of the social order, and they dealt with things having to do with death, I may make a commentary every once in a while, like the eta was, as a class, disbanded in the 19th century but they basically changed the name from eta to burakunin but basically it's the same social class. They deal with death and a lot of them have shoe stores because shoes are made out of leather. THOMPSON: I would imagine the idea of classes would be something an American audience would recoil at. How do you handle Usagi's response? SAKAI: Well, you know, he's pretty friendly; he pretty much treats all the social classes the same, which a real samurai at that time would not do. I think he reflects my own personality to a degree. THOMPSON: But then, just about every cartoonist's major character tends to become a surrogate for the cartoonist. THOMPSON: Do you have any Japanese fans who write to you from Japan? SAKAI: Not really, not on a consistent basis. I would get a couple every so often but Usagi's not translated in Japan. There's never been an American comic book that has really made a big impact on the Japanese market. I was featured in a prominent Japanese magazine but aside from that, there's been no response as far as the Japanese market goes. THOMPSON: The Japanese market is pretty, no pun intended, insular. So you're bigger in Germany than you are in Japan! SAKAI: Uh-huh. [laughter] And Croatia! THOMPSON: Dark Horse had started Usagi as a limited series then just kept it going. SAKAI: Right. 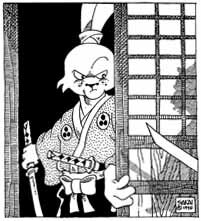 It is a nine times a year series, but we've been going pretty much on a monthly schedule, going from Space Usagi straight into Usagi Yojimbo . For the first 15 issues of Space Usagi and Usagi we've only missed one month. SAKAI: Yeah. My penciling has become a lot more non-existent since I began working with Sergio. I remember when I did the Usagi story for Critters #1, I was proud that I did that eight-page story in just one month. Now I can do a 24-page story in a month. THOMPSON: It's no wonder you don't have any time to see movies or read comics. SAKAI: Well, I've got kids now, too. They love going to conventions. Hannah is six now, and she's been making mini-comics. She made $35 at the last San Diego Con. Quite an entrepreneur. THOMPSON: Cartoonists' daughters are real shakers and movers. One of the things you mentioned earlier was the fact that you sold two and a half million Usagi dolls... and still Usagi the comic is doing 10,000, 12,000? So, why can't we get every one of the kids who gets a Usagi doll to also buy Usagi comics, or even just one in a hundred of the kids? How do we make comics a mass market again? SAKAI: It's really hard. Kids just don't read any more. They spend much more time with video games. It's just hard to get kids to read anything. Book sales have dropped dramatically, too. I think 90% of the books are bought only by 5% of the US population. Unless it's a book about the Simpson trial. Evanier makes the comparison between the US and Japan, where the literacy rate is 99%, and even adults, businessmen read comic books on the streets, and here, it's pretty much a children's medium. THOMPSON: A children's medium that children don't read. SAKAI: Exactly. Even those who buy comic books don't read them any more. There was a sudden decline in both book and magazine sales and they traced it back to the time when Pac-Man first came out. Kids are spending all their time playing video games, or watching TV. THOMPSON: Proportionately, comic books cost a lot more for the entertainment that you're getting. THOMPSON: So, what's the answer? THOMPSON: No one has any idea. THOMPSON: Yeah, Batman sells something like 70,000 copies. So, if comics actually did completely and utterly die, what would you then do for a career? SAKAI: I have no idea! THOMPSON: That might be the main reason there's so many cartoonists sticking around: they just have no idea what they can do other than comics. SAKAI: I think so, yeah. THOMPSON: That's what Peter Bagge and Dan Clowes say. They have no other marketable skills whatsoever. SAKAI: That's probably where I am. THOMPSON: Well, you've done commercial artwork. Do you do much of that any more? SAKAI: Not really. Most of my time is spend doing Usagi Yojimbo but once in a while I may take the odd job in commercial artwork, and it does pay a lot more. About 10 years ago I did some work for Mattel on their Captain Power games and things like that, and I would make $300 a hour. Comic books -- they pay a little less. THOMPSON: You're lucky if you get $300 a week. SAKAI: It gives me the autonomy. I have my studio at home, I have a separate room that I can set up in, and the commute time is almost non-existent [laughter]. THOMPSON: Did you ever find the hidden message on this site? SAKAI: I believe this is the one for October, 1997. THOMPSON: And you have complete control, especially now that you're back in black and white, so in its own way it's a dream job. SAKAI: If only I could make a lot more money off of it. THOMPSON: Anything else you want to talk about? THOMPSON: I know, it's weird -- somehow disquieting. SAKAI: Well, I had to go back and count everyone's fingers after I had done it just to make sure I had put five fingers on them. And I'm doing things like covers and pinups for other publishers. There will be a role-playing game. Oh, Antarctic Press is going to publish an Usagi Sketchbook. Basically, it's a pin-up book. A lot of it is things like the endpapers for the Usagi hardback books, calendar art and drawings that were very rarely seen, convention sketches and commissions. Also, the Diamond Previews catalog is serializing an Usagi story over the period of one year. There is a two-page episode each month, which is a new challenge. The story has to be paced so that each two-page installment has to interest the reader and end with a cliffhanger. The plot has to be summarized every so often for the benefit of new readers but not too often or too obviously or it will become redundant when the entire story is collected into a single volume. Frankly, I had a difficult time thinking up a story but I happened to be reading Musashi by Eiji Yoshikawa and one of the chapter titles, "Green Persimmons," caught my eye, so I wrote a story about a mysterious green porcelain persimmon which comes into Usagi's possession and everyone seems to be after it. I've enjoyed my tenure with Dark Horse. It's pretty much the same with all my other publishers in that they leave me alone.